The inauguration of the Bank of Mexico’s second banknote printing facility has taken place following increased banknote demand in the country. 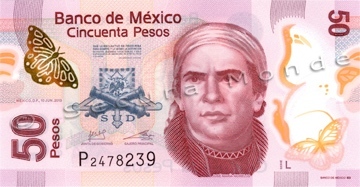 Mexican banknotes have been printed by the state’s banknote printing works located in Legaria, Mexico City, since its opening in 1969. The demand for Mexican banknotes has consistently increased, however, with the Legaria printing facility producing 201 million banknotes in 1970 but almost 1.5 billion in 2017. At the time of opening the Legaria print works, Mexican banknotes were printed on cotton-paper substrate. The printing facility has adapted over time to also produce Mexican notes printed on CCL Secure’s Guardian® polymer substrate and Crane Currency’s ENDURANCE™ durable coated paper substrate, to increase the lifespan of notes in circulation. Even with the increased durability of notes in circulation, the demand for banknotes in the country has caused the existing Legaria print works to come close to its production capacity. This, combined with the country’s anticipated population and economic growth, led to the start of a project to open a second banknote printing facility in Mexico. The project began in 2010 with building work starting on 14 October 2015, and concluded with the opening of the new banknote print facility located in Guadalajara, Jalisco, around 350 miles east of the existing Legaria facility. It was decided that the new print works should be built in a separate geographic location to minimise risks associated with the production of banknotes in one place. The Bank of Mexico advise that Guadalajara provides extensive road and airport infrastructure, enabling good access to Mexico City and the effective and efficient distribution of banknotes to mainly the northwest and west regions of the country, including the states of Aguascalientes, Baja California, Baja California Sur, Chihuahua, Durango, Jalisco, Michoacán, Nayarit, Sinaloa, Sonora and Zacatecas. The Guadalajara print works, built on a site of approximately 38 thousand square meters, has one production line but includes sufficient space to include a second production line in future if required. It also includes a reserve vault with a capacity of 5,500 containers, around 35% more than the Bank of Mexico’s existing storage capacity. Around 250 staff will be working at the new site. The new banknote printing facility is able to produce banknotes in both polymer and paper, ensuring it is able to print all of Mexico’s banknote denominations.